The University of Notre Dame (Notre Dame, IN, USA) has a replica one-seventh the size of the famed French shrine. 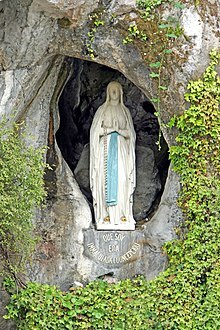 It was built in 1896 and is called the Grotto of Our Lady of Lourdes, or, the Grotto. To ensure claims of cures were examined properly and to protect the town from fraudulent claims of miracles, the Lourdes Medical Bureau (Bureau Medical) was established at the request of Pope Pius X. It is completely under medical rather than ecclesiastical supervision. Approximately 7000 people have sought to have their case confirmed as a miracle, of which 69 have been declared a scientifically inexplicable miracle by both the Bureau and the Catholic Church. ^ "2009 Catholic Almanac". Our Sunday Visitor Publishing. ^ Visentin, M.C. (2000). "María Bernarda Soubirous (Bernardita)". In Leonardi, C.; Riccardi, A.; Zarri, G. (eds.). Diccionario de los Santos (in Spanish). Spain: San Pablo. pp. 1586–1596. ISBN 84-285-2259-6. Laurentingeneral, L. (1988). "Lourdes". Marienlexikon. Regensburg: Eos Verlag.